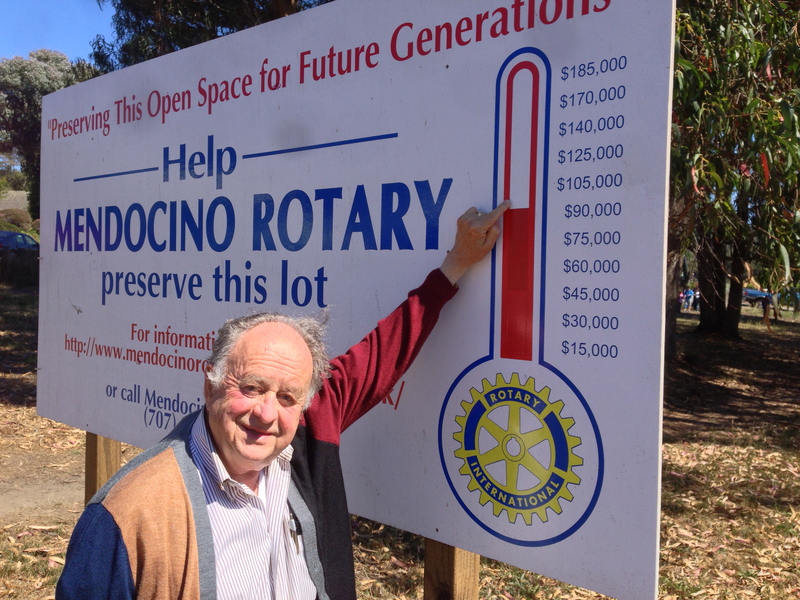 Mendocino Rotarian John Porter points to the total amount raised as of September 20, 2013. This project has since been completely funded, and the land purchased in 2014. Each December, Rotary hosts a tree lighting event (12/3/16) and Santa in the Park with caroling, face-painting and candy canes for the kids (12/17/16 from 1-4pm). Bring your family and enjoy! Do you want to host an event in Rotary Park? Contact us at hello@mendocinorotary.org to set it up! The Rotary Club of Mendocino and the Mendocino Rotary Foundation continue to work on improving the natural beauty and usability of the Park. Plans include landscaping, improving accessibility, lighting, performance area, paving stones to honor donors, and picnic areas. Fundraising to support these efforts is ongoing. Stay tuned for news here! Mendocino Rotarian Tom Honer, owner of Harvest Markets, learned from Realtor Barry Cusick in December 2012 that the parcels at the corner of Main and Lansing in Mendocino were for sale and that two different developers had made offers on the open space with the idea of constructing commercial buildings on the site. Cusick also learned that the property owner was willing to sell the land, valued at $850,000, for $150,000 to a non-profit if they would guarantee to save it from development. Honer recommended to the Rotary Board that the club purchase the property and create a park to keep the lots as open space for future generations to enjoy. The Board and membership approved. Fundraising for future improvements to the site continues. 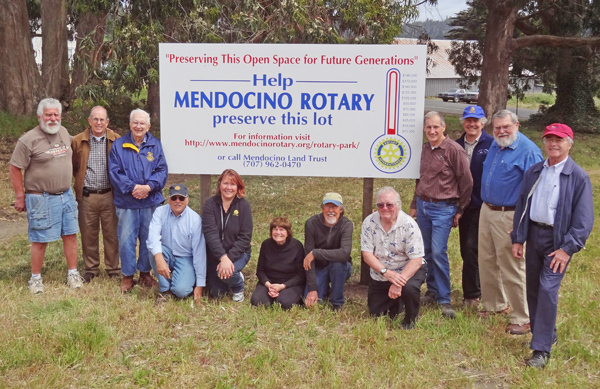 The Mendocino Rotary Foundation will work with the local community to develop plans for enhancements to this open space, so that it may best serve the community for generations to come. Your involvement is welcome! In less than two years, we realized our vision of creating Rotary Park and preserving this beautiful open space for future generations. We received generous support from a wide cross-section of our community. We are proud that the Rotary Club of Mendocino won a Green Award from Rotary District 5130 in recognition of the significance of this project. Most of all, we are proud that Rotary Park is now a reality.